How can we care for the soil, the water, the air, the plants and the creatures in our valley and our bay? How can the HVPA help the community pool their environmental care resources – knowledge and labour – to achieve the best possible result? How can we develop kaitiakitanga as a lifestyle, a cultural, a recreational and an educational opportunity? Although stewardship encompasses many aspects of the environment, forest restoration has been one of the more popular activities, so we will look briefly at what has been happening with the restoration of our local reserves. Due to early farming in Houghton Valley our present forest cover is secondary growth developed from completely bare hillsides. Once farming ceased the slopes quickly reverted to gorse, which regularly went up in flames around the 5th of November. It was not until sky rockets were banned that natural regrowth started to make good headway. Intentional planting of natives in the began in the 1970s. The corner of Buckley Road and Houghton bay Road was one of the first to be planted, to ‘beautify’ the newly completed rubbish tip. In the 1980s, Kae Miller planted natives on Te Raekaihau Headland (the reserve at the end of View Rd South), and other locals planted more fire resistant natives to try and prevent the constant setbacks. 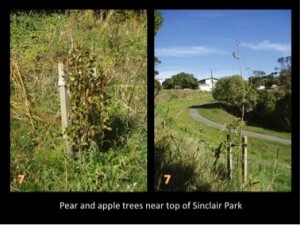 Forest restoration has blossomed in Houghton Valley, and recently there have been several different groups planting at Te Kawakawa Commons, Buckley Road Reserve, the gully between the school and the playcentre, the zigzag (steps down to Lyall Bay), Te Raekaihau Headland, Cave Road, and Te Raekaihau Point. 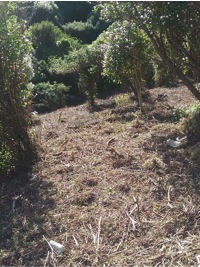 The Wellington City Council has also been involved, providing hundreds of plants for locals to plant, and ranger assistance. All these groups have been working independently and following their own ideas about environmental restoration, or just working things out as they go. Some have done their own research about what is best for their patch, others rely on the recommendations of the Council. Some battle on with just a few loyal volunteers, others tap into resources such as Conservation Volunteers, internet volunteer opportunities, students or corporate volunteers, or they ask the Council for help. The Council will not let volunteers to use machinery or sprays on their land without specific training, but will do such work if asked. Council contractors often are fairly heavy handed when clearing or maintaining tracks, and many a lovingly planted tree has been mown down if it was too close to the track. They also use sprays to control weeds, which not everyone appreciates. Some groups prefer to do their restoration without chemical or mechanical assistance, maintaining that chemical sprays reduce both the microbial and future plant diversity of the regenerating area, and that weeds can be used as protection for new plants in a harsh climate. It needs more after care, but no revegetation project will be successful without after care. 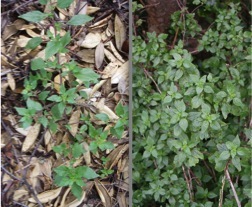 No matter how thorough the preparation, weeds will still return before the new plants are big enough to shade them out. 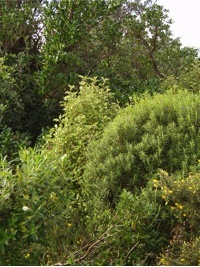 Te Raekaihau Restoration Group – plants up on the Te Raekaihau Headland have to cope with some very harsh conditions. Some plants were chosen for survival out in the open but were planted by clearing pockets amongst the weeds. 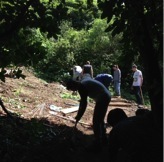 Other plants were chosen for planting in light wells cleared in the karo canopy. Karo has been deemed a “weed” by ecological purists. However it isn’t long lasting and it is ready made shelter for young trees. It is more fire resistant than gorse and the flowers provide good fodder for bees and birds. 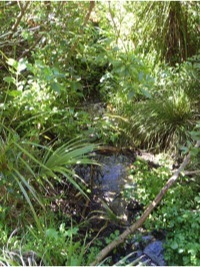 Where light wells were not created, understorey plants have not survived as the light levels were too low and not enough rain reached the plants in the summer. TRiG works in conjunction with the Kae Miller Trust, which has also done planting around the Alice Krebs Lodge on the headland. building of a network of short tracks, the area has been transformed from a scrubby wasteland into a valuable community resource. With generous amounts of mulch supplied by the Council over 6 years there has been a very high plant survival rate and energy in fact has to go into creating airspace for competing plants and to keep the paths cleared to enjoy it all. Without the help of the Conservation Volunteers they would be struggling to do this. Friends of Buckley Road Reserve – since this group started in 2002, with the help of the WCC they have planted more than 6,000 trees in the reserve that runs the length of Houghton Valley, alongside tracks and under the karo canopy. Flax planted in the wetland below the playground near Hungerford Road has unfortunately succumbed to yellow leaf disease, but other wetland plants such as kaihikatea are still thriving. Houghton Valley School Rainforest – since 2004 school students have been planting trees with the help of the school caretaker. There is an outdoor classroom where children can learn about the environment and how to care for it. Tracks through the forest are popular for exploring, playing and cross country running. This area has been looked after by more than one interest group, and their approaches have been quite different. In the last couple of months the WCC was asked to help clear a small part below the road that included old man’s beard amongst the weeds. It has now been planted with Council supplied trees by students from outside the community. The results look impressive to the casual observer, but now there is no sign of the many self fertilised regenerating seedlings that had been growing amongst the weeds. Another sad thing is that in 2002 the area was cleared in a similar fashion and planted with trees, very few of which have survived. So the net result of forest regeneration in the last 16 years is virtually nil, whereas other parts of the rainforest that did not undergo clearance in 2002 are coming away well. It is hard to know whether the lack of success over the last years was the result of the initial condition of that particular patch, the effects of clearing and spraying, or the lack of aftercare, but we do know that we need to ensure that this time they survive! What lessons can we take away from the success or otherwise of our tree planting efforts in the valley? There is now enough cumulative experience that we can start sharing what works and what doesn’t. Wouldn’t it be good to pool our knowledge and come up with a best solution approach to forest restoration in Houghton Valley? Another thing is that trees need five years of care once planted, and weed and pest control is virtually ongoing. So once a person or people have taken on a small patch, to have enough time or energy to work elsewhere is difficult to achieve. So to create a labour pool as well as a knowledge one, could mean we help each other out with our projects; making for variety, further sharing of knowledge, and an increase in community feeling. What can the HVPA do to assist planting groups? The HVPA carries public liability insurance, often necessary in these times, which can be extended to approved projects. Tree planting, beach clean-ups, stream restorations, these are all seen as feel-good activities, but they are mostly on the fringes of daily life and are usually sidelined when the pressure of keeping afloat becomes too much. 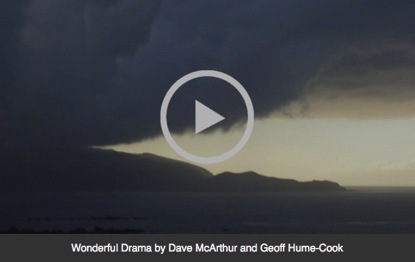 Kaitiaitanga is an essential part of Maori culture, and for them a lifetime commitment. Is it possible to make looking after our wider environment an intrinsic part of our lives? How could we achieve it? We would love to hear your ideas. We all understand about looking after our house and garden, and one would hope that most people take pleasure and pride in doing so. 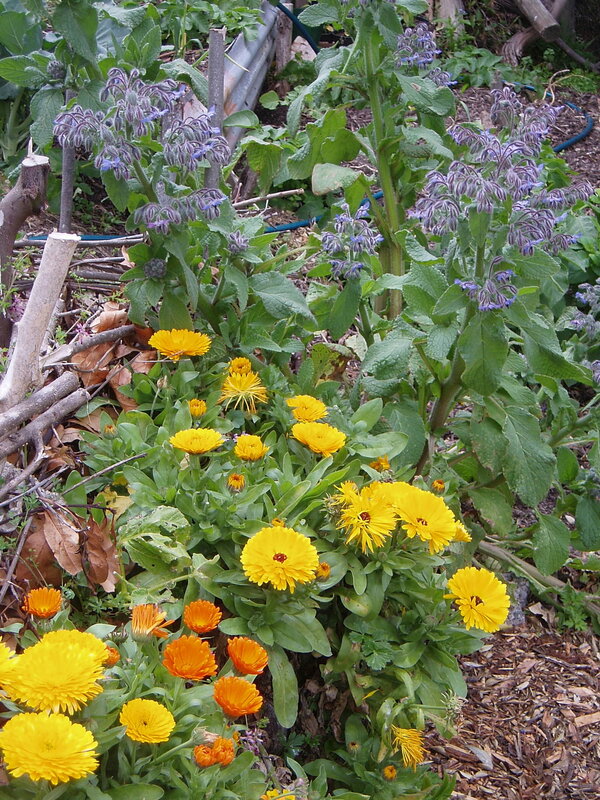 Looking after the environment could be seen as gardening beyond the boundaries, or suburban permaculture. It can be a way of getting fit, improving health, educating children, or simply feeling good. There is nothing more rewarding than seeing a tree you have planted grow and thrive, and over many years the pleasure increases exponentially! Welcome to part two of our three-part look at the Houghton Valley Progressive Association in the lead up to their AGM on July 8 (4pm in the hall). Our school principal, Luana Carroll, will be the guest speaker at the AGM. This is a chance to welcome her and hear how the school values their relationship with its community. As well we will discuss the future of the Association. In this newsletter we look at the HVPA’s greatest asset: the community hall. However firstly, a word of explanation as to the origin of the content of these newsletters. 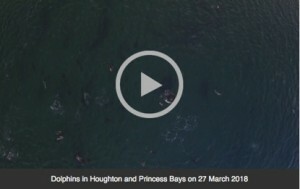 It has been put together by a group of locals concerned about the future of the HVPA. The viewpoints and suggestions expressed are theirs and not of the organisation per se. Some of the viewpoints are provocative, to stimulate discussion. For if we lose our organisation through community indifference we also lose our community hall. Maybe it is worth sticking our necks out to create a reaction if it helps to keep them both going. We fully realise that the views may not be yours. If you want your views or suggestions to be heard then come along to the discussion. That is what community is about! Do we still want our community hall with the problems of use and maintenance that ownership entails? Will the hall ever be the main focus of our community again, and is this important for our community? Should we treasure our hall and pass it on to the next generation? The hall is currently underutilised, how could we use it more? The Houghton Valley Progressive Association is struggling to look after their dilapidated hall, and are considering selling it. A developer has expressed an interest in buying the land and wants to build a multi-storey apartment block on the land. The upper apartments would take full advantage of the spectacular views. “We can do our bit towards solving the housing crisis” says a HVPA spokesperson. As far we we know, our community is the only one in Wellington to own both their hall and the land; others are owned by the Council and/or sit on Council land. 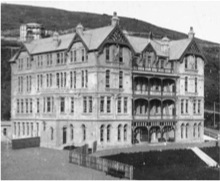 In 1929 a local family donated a piece of land to the HVPA, and the association raised 100 pounds towards materials and used voluntary labour to build a hall. The design had to be shortened as excavation of the rocky soil was so difficult. 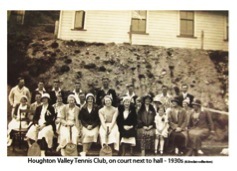 It was opened on 10 August 1929, and was named the Haughton Valley Hall. A lower terrace of the land was developed into tennis courts. 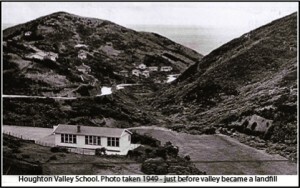 The use of the hall was intended to be for community meetings and club rooms, but early on it was rented to the education department for use as the valley’s first school. The hall was the hub of Houghton Valley community throughout the Great Depression of the 1930s and WWII. The HVPA ran it to full capacity with regular dances, sporting activities, civics classes for children, League of Mothers meetings, and card and quiz evenings. However community use of the hall declined in the 1950s with the advent of the car, cheap petrol, and television. Indeed those who lived through this period describe community life in terms of “before the car” and “after the car”. The hall’s dominant use from 1942 was as a Playcentre but this ceased in 1997 when the Ministry of Health decreed the lead paint on the outside walls made the building unsafe for children. So the HVPA leased old the tennis court land to the Playcentre Movement, and the current playcentre was constructed that year. Another important community use of the hall in this period was as a Civil Defence Centre. Up to 50 local residents met there regularly till the early 1990s to train in triage, social welfare, communication and other systems so that the community could be more resilient in the event of an emergency. Other activities included Cubs, Scouts, Brownies, the Townswomens’ Guild, the Tennis Club. The hall has always been a place of dance and music, more recently taking the form of dance studios. By the 1980s there was serious concern about declining use of the hall and by the 1990s it also needed a lot of work. When the playcentre lease and the sale idea fell to the ground a few local residents stepped up and volunteered considerable time and even materials to repair rotten walls, replace the roof and strip and paint most of the building to avoid demolition. The hall has since been repiled and the floor strengthened to enable vigorous activities such as dancing. This generation of Houghton Valley residents inherits a community hall in a far better state than twenty years ago. For the next 12-15 years, the HVPA successfully maintained a regime of ensuring the maintenance costs were covered by allowing small businesses to use the premises. It was mostly used as a dance studio and still is today. One local took on most of the maintenance during this time. In 2012, there was a change in management, and a renewed commitment to make the hall once more a community resource and the hub of community activity. Lectures and public meetings, Neighbour’s Day celebrations, banner painting, Koha Coffee mornings and a kitchen upgrade was the result of the revival. However keeping this momentum has proved difficult, because the hall had become virtually invisible over the years it was let out, and the focus of the community has shifted to the school. A lot of the discussion from the hall’s history is very similar to our concerns today, in particular the balance between use and income to ensure maintenance, but also how the use of the hall reflects the ebb and flow of community involvement generally. The community use of the hall is currently at an ebb again. These days people lead incredibly busy lives whether they wish to or not. The popularity of the school has meant the arrival of more younger households into the area, and family life is generally all-encompassing. However, over the years there have been several occasions of crisis, and each time a few individuals have come forward and either revived or downright rescued the hall. Long may the cycle continue! Not a complete ebb though … this Saturday June 30 Koha Coffee will be held in the community hall from 10.30 til about 12.30. If you haven’t been to the hall, or not for a long time, come and experience its old fashioned charm for yourself; have coffee, eat goodies, play table tennis or the piano, dance in front of the mirrors, browse the lending library, and meet and chat to other locals. And if you have been recently, come and catch up again. So what happens now? That’s the question the last quarterly HVPA meeting asked, and is looking to the community for their ideas. Do we keep the hall partially rented and partially used by the community, leaving the the responsibility of looking after it to a few volunteers? Or do we lease the hall fully to someone and use the total rent to keep it in good shape? Is there anything else that could be done? A timeline is also required as we need to appreciate our current users. The Common Unity Project has set up a Remakery in Epuni to rebuild and upcycle unwanted stuff including old bicycles and remnant fabrics. The operation also promotes urban food growing and bee keeping, has a local food shop and a local food catering service. School children grow sunflowers for bees and sell their seeds around the country. It’s been a while since the last newsletter, but there have been several recent issues, actions, reactions and changes in focus; creating questions that have needed some clarification before putting them out to the wider community for discussion. The AGM of the Houghton Valley Progressive Association is coming up on Sunday 8 July (4pm in the hall). There will be a discussion focussing on these questions – encompassing the role of the HVPA, the use of the hall and the care of the environment of our valley. The discussion and consequent decisions will be the basis of the aims of the HVPA for the coming year. We will also celebrate the HVPA new year with a talk by our school Principal, Luana Carroll, on how she sees the school interacting with the community and caring for the area. Up until the AGM there will be three newsletters at one week intervals, each featuring one set of questions, and providing some background information to support the discussion. We start here with the questions about the Houghton Valley Progressive Association. Should the Houghton Valley Progressive Association reinvent itself – its name, its structure, its activities – to become more relevant? How can we make it one of the community’s greatest assets? 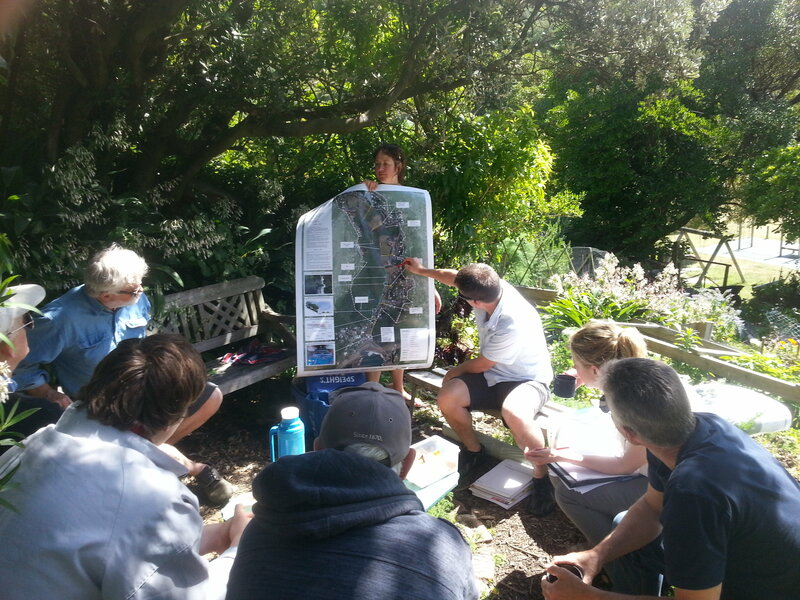 How can it reflect a new outlook, based on principles of proactive community and kaitiakitanga of the place we inhabit? 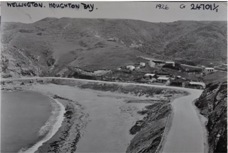 In 1925, the residents of Buckley Road, Houghton Bay Road and View Road formed the South Melrose Ratepayers and Residents’ Association, with the aim of getting action on long overdue basic services such as a bus service, milk supply, electric street lighting, an extended water and gas supply and extended drainage, as well as telephone services. In 1926, owing to confusion with Melrose, the Association was renamed the Haughton Valley Progressive Association. 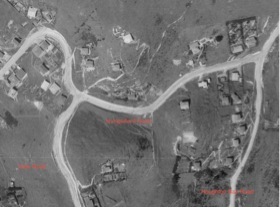 By then many of the services had been improved along with the building of 30 more houses. 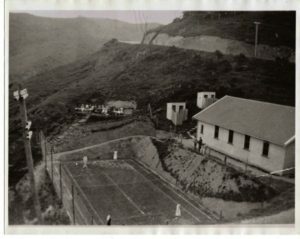 In 1927, a local family donated land on which to build a community hall and tennis courts. There is a fuller account of these early beginnings on the Houghton Valley website. 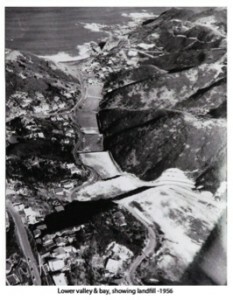 In 1944 issues were a little more refined, such as the need for a bathing shed at Princess Bay and an improved bus route. The HVPA continued to contribute to the vitality of our community in a range of ways over the years. It facilitated Civics lessons for our children and dances for the adults in the 1930s; preschool education since the 1940s; and, until the Civil Defence reforms of the mid 1990s, it helped ensure the valley had a strong contingent of trained volunteers in the event of a Civil Emergency. Every decade or so another small group of Houghton Valley residents has stepped forward and replaced HVPA members who can no longer contribute their services to our community. Similarly the community uses of the hall have periodically changed in ways unimaginable to our HVPA ancestors. The time has come again for such review and the need for refreshment is upon us now. As you have seen, our organisation name has been changed once before. We are beginning to wonder whether this now quaintly old fashioned name is appropriate for today. In 1926, progress in the valley was important to establish basic amenities. “Progress” over the years since has included filling large areas of the valley with the city’s excess garbage and converting its clean waters into high-risk leachate and pumping it several kilometers to Happy Valley tip (or out into the bay in high rainfall). Projects that didn’t make it included converting our fields into a light-industrial zone, or covering several of them in tarmac for a netball faciilty! Today, we need to progress beyond “Progress”. Progressive behaviour involves careful resource use, ensuring access to affordable and democratic infrastructure, conserving our endemic soils, water, forests, wildllfe and solar potential, and respecting our Maori taonga. Other community entities include the phrase “Residents and/or Ratepayers Association”, and are perceived as being the channel through which ratepayers lobby the Council for improved services. But maybe we need an entity that is ours first and foremost, for us to help improve our own community. Looking to the Council for help may not be the only solution. The HVPA is a registered association with charitable status, like a club or society, exempt from having to pay tax. But with that status comes obligations in the form of committee meetings complete with agendas, financial reports, voting and minutes. Designed to keep organisational and financial accountability, it is never-the-less an archaic system not suited to people with busy lives. Many groups doing good work in the valley at the moment are completely ad hoc, operating on zero budgets and an email list. Maybe it is time to find a more appropriate organisational model to base our community voice on, one that increases the inspirational activities and decreases the red tape. We have to bear in mind the realities of public liability and the possible need for applying for grants. However, trusts are less demanding in terms of membership, and one of the most enduring community models in this country is the marae. It’s time to think outside the square! Recently there have been examples of concerned locals doing something about a situation that bothers them. 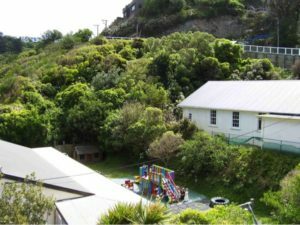 A small group approached the Council and the Cook Strait News (May 24) about the need for a better playground at the top of Sinclair Park. 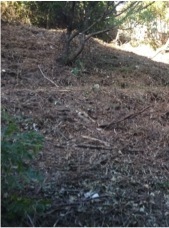 Another local called in the Council to help with weed clearing, who did their job in a typically insensitive manner (see photo). In earlier times people would have come to the HVPA, who would have discussed the issue with the community and approached the Council on their behalf. A community organisation is there to listen to and represent its community. It can be slower and sometimes more fraught to get the wider community engaged in a project, but it is ultimately a far richer experience – the making of friends and the making of community. Another medley of items: this time video is being featured, maybe it will inspire you to send in some footage you have taken that celebrates the place where we live. Don’t forget I am happy to use photos that you have taken for the newsletter banner. The next Houghton Valley Progressive Association meeting is coming up this Sunday, 4pm at the community hall. All are welcome. Under discussion will be the Greater Wellington Regional Council Long Term Plan and the WCC Long Term Plan coming up for consultation on April 15th. If you are interested in what is happening over the hill, the Kilbirnie-Rongotai Progressive Association is having a meeting on 12 April at the Harbour City Chapel at 7.30pm. They will be having a guest speaker from Wellington Water with an update on storm water and the Kilbirnie pump station. Upper Houghton Valley has a fine view of the Baring Heads, a promontory at the South-West entrance to Wellington Harbour. Dave McArthur has a spectacular view of the headland and has documented the ever-changing forms of water in the sea and sky over several years. Together they form a graphic ‘riff’ on his view of that headland. This week (March 19-25) is local food week in Wellington, the sixth year Wellington has celebrated it. So I have been around and photographed all the wild/community fruit trees I know of in the valley, and they feature in this newsletter. If I have missed any, feel free to contact me and I can add to the list. Most trees are fairly young and not fruiting yet, but it is good to know that there are sheltered pockets in the valley where fruit trees can survive the wind, salt and the Council mowers! Little Free Libraries, or Lilliput Libraries, is an international movement that promotes community, responsibility, and the love of reading. Little free libraries are small book exchange libraries that people are starting to put up all over their neighbourhoods. Locals get together to make and decorate them. They are placed on private property out near the footpath so that passers by can give or take books from it. Each one has a caretaker. 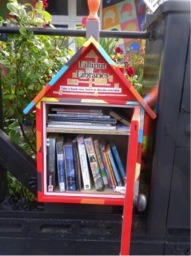 If you are interested in designing, building, hosting, or being a guardian of a Little Free Library, please contact Jessica Loomis at jexico@gmail.com. As the Salvation Army complex is nearing completion we have heard through the grapevine that Newtown New World is going to have an $80 million makeover of their current store. It is intended to be their headline store for Wellington. Maybe one of these big players could expand their social services and fit in a post office! Te Raekaihau Headland surprisingly has a couple of fruit trees tucked away in sheltered spots. Site No.1 is an apple tree at a junction of several tracks including the Kae Miller track, known as Bulldog corner because of the bulldog statue commemorating a local pet. The tree was planted by a local, Piebe Kooistra, who during his latter life created and looked after many tracks on the headland and planted many trees. Site No. 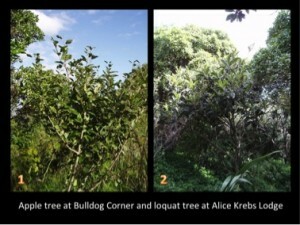 2 is a loquat tree at the Alice Krebs Lodge near the highest point of the headland. 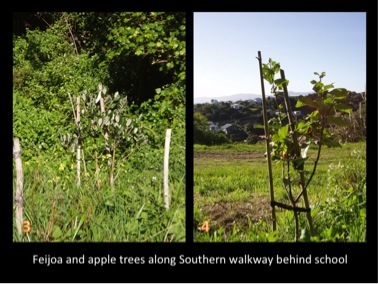 On the Southern Walkway track leading up to the horse paddock behind the school, five fruit trees were planted on the bush side by locals as part of the WCC Fruit Tree Guardians Project. 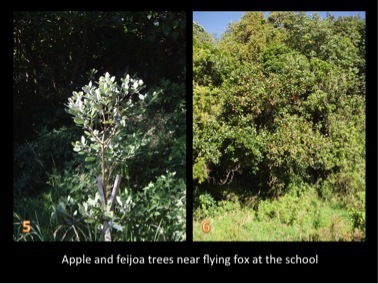 Site No 3. has two feijoas and a apple planted near the bottom gate, and site No 4. has two apple trees further up, near the track to the school. On the track from the Southern Walkway down to the School, school children planted two feijoas at a sharp bend, site No. 5. Unfortunately only one has survived. At the bottom of the path and along a bit is site No. 6, an established apple tree, which bears a good crop of apples most years. 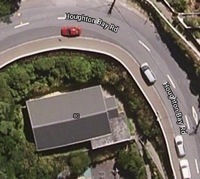 At the top of the Southern Walkway track, just before Buckley Road, site No. 7 is a group of four apple and pear trees planted by another local fruit tree guardian who is no longer living in the valley. This is a great spot for more trees as it is very sunny and sheltered. The community gardens just North of the School, site No. 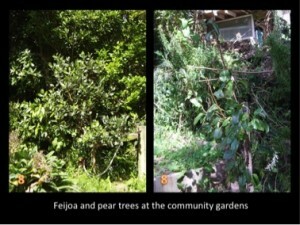 8, has three fruit trees, a lemon, a pear and a feijoa. 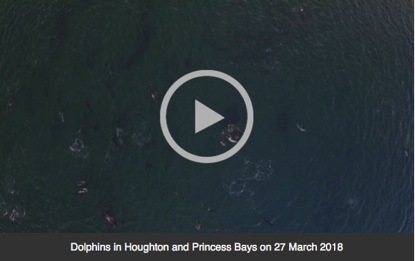 The picture above shows dolphins sporting in Houghton Bay a couple of weeks ago. We are so lucky to have both bush and sea right at our doorstep! Photo by Jan (Ian) Vorster. Houghton Valley is joining the crusade to rid the country of rats, stoats, possums and their fellow destructive predators by 2050. DOC estimates that 25 million birds are killed each year by rats, stoats, possums, ferrets, weasels and feral cats, and it costs the country more than $70 million to manage these predators. Predator Free New Zealand, an independent trust, is leading a campaign for trapping in urban environments. Predator Free Houghton Valley is supplying free traps to residents to help with catching small predators. All they ask in return is that you keep your traps regularly baited and report any catches that you make. This will provide them with the information required to gauge the effectiveness of the campaign and their progress to being predator free. One in five households is a minimum to provide coverage to the area. So far there are 30 traps in Houghton Valley, about one half to one third of what is ultimately needed. Victor Trap – passed international standards for humaneness of kill traps for killing stoats and rats. 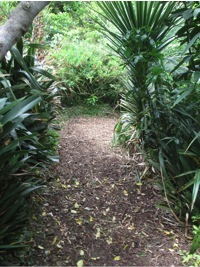 Wooden Tunnel – the tunnel is provided to orientate the animal relative to the trap inside and to protect pets, children and non-target species from the trap. Over the last couple of years a weed has invaded Houghton Valley and the rest of Wellington, going by the name of asthma weed, due to its asthmatic effect on people. It has been known to cause skin rashes. It goes by the latin name of Parietaria judaica L, and is also known as pellitory. It comes from Northern Africa and Southern Europe. It grows everywhere, liking sun, shade, dry and damp. However it seems to prefer less cultivated areas such as coastal cliffs, roadsides and waste areas. It grows well in cracks in concrete and rocks. So maybe we need to increase the nutrient value of our gardens to discourage it! The RLTP sets out the direction for the region’s land transport network over the next 10-30 years, and a programme of transport activities proposed for funding from 2015-21. The purpose of the mid-term review is to make sure that the RLTP still meets our region’s needs for the next three years (2018-21). The main focus of the review is on the regional programme of activities. As part of the mid-term review they are carrying out public consultation. They would like to know which of the significant transport projects in the draft plan you feel should be our top priorities. These are projects with a total cost of more than $5 million that are regionally and/or inter-regionally significant. Your feedback will help the Regional Transport Committee to finalise the priority order of these activities. You can find more information about the project, the scope of the consultation and how to make a submission on the Greater Wellington website: www.gw.govt.nz/rltp. Consultation closes at 5pm on Monday 12 March 2018. The Council has received a change of condition application for the development; for changes to wording of conditions of the subdivision consent to allow for the intended staging of the development. The Council’s reference number for this application is SR No. 404646. If you are a concerned neighbour and would like to know more about this application, contact a Planning Technician on 801-3590. Maybe you might like to report back what the changes are. 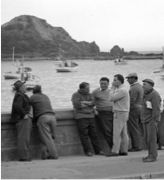 I wasn’t intending to do another newsletter quite so soon, but there are some events hosted by the Wellington Southern Bay Historical Society as part of the Island Bay Festival next week that you may be interested in. Learning about the history of where you live is a good way of feeling that you belong. 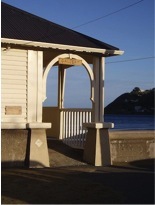 The Historical Society will have specially illuminated historical displays, maps and photographs of Wellington’s Southern Bays available to view in the Island Bay Surf Club Hall from 10 am to 4 pm, as part of the Day in the Bay gathering at Shorland Park. From there you can also view the Blessing of the Boats, or enjoy a seat and ice cold drinking water. The Wellington Southern Bays Historical Society is holding an Open Day at the Island Bay Community Centre, 137 The Parade, from 10 am – 2 pm. They have a large collection of historical displays, photographs and folders, including Houghton Bay. Colin Feslier will give a talk on the history of Island Bay with displays and photographs, with some reference to Houghton Bay as well. It will be at the Island Bay Community Centre from 3 – 4 pm. For more details and the Society’s full Festival programme, contact Marion Findlay at marion.findlay@xtra.co.nz. Looks like the Wellington weather we know and love is back from a long holiday! Items for the newsletter have also had an extended break, but now there is sufficient editorial. I hope the newsletter will be a little more frequent from now on, but I have decided it will be by demand only, so please send me any news you would like to share with the community. The first meeting for the year is at the hall on Sunday 11 February at 4 pm. Everyone is welcome at our meetings. 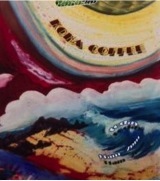 Or you can just get on the mailing list for agenda and minutes by contacting Ken at kenandmirandaoe@gmail.com. Family membership is only $10 a year, and includes a FREE membership gift of hall banner cards … not available at any other outlet! As part of the build up to Local Food Week (see below) if you have any garden or harvest surplus, maybe you would like to bring it along to the meeting to share with others. This is a week celebrating all that is happening around community food projects: local food, food waste, food distribution, good food business, school programmes, community gardens and more. The week also coincides with Neighbours’ Day, so it could be an opportunity to combine the two. Any ideas as to what could be done? I will feature local food in the next few newsletters, to whet your appetite as it were. 15% of respondents did not want a new carpark. 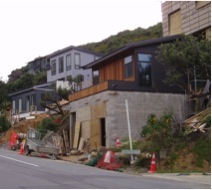 The closer respondents lived to Lyall Bay the more they wanted additional parking. The only groups that did not prefer Option 1 lived outside of Wellington. Among those who responded, the main reason for visiting Lyall Bay was surfing, followed by walking the dog and going for a walk. A smaller number of people who responded were visiting to get something to eat and drink or go for a swim. Option 1 was preferred amongst all of these user groups. Your community newsletter is back! Many people have missed our regular community updates, so I have offered to take over sending out newsletters every two three weeks, depending on events in the Valley. For this quick pre-Christmas newsletter, we have imported into MailChimp the old newsletter list that you originally signed up for. So if you have moved on and don’t want these newsletters, you can now just click on the unsubscribe button below. However, if you do want to stay on the list, I hope you will enjoy once again finding out what is going on in and around your community. Please feel free to contribute news items to this newsletter, contact me at the email address below. It can be upcoming events, reports of events past, or anything of local interest. If you would like to send a photo for the title banner, it would be good to change it each time. The ice cream stall back again! Join neighbours and friends at Te Kawakawa Commons (near 46 Hornsey Road above the bus stop) for a get together on Christmas Day between 11am and 1pm. Bring some food to share and take home some vegies! People are keen to start up the coffee mornings again at the hall on Saturday mornings from 9.30 – 12.00 throughout the warmer months. So far we have three people prepared to be the coffee makers for a regular monthly roster, and one casual helper. We need one more person to keep a weekly session going. Any offers? We have some new, smaller and more user friendly coffee machines to get the beans doing their stuff! One way and another Grant from Hungerford Rd and Norman from View Rd have been involved with this newsletter for quite a while; Grant was the catalyst for it being established and Norman has served an extended stint as ‘editor.’ They agree it may have run its course but have different ideas about ‘what’s next’, here are their respective perspectives. Grant writes: There is a season turn, turn, turn: a time to gain, a time to lose; the time has come for our beloved email newsletter to enter into its winter hibernation. It may awaken in the spring, if that’s what the community decrees – but in a different form. Maybe we do not need the newsletter, because Facebook does it all, or perhaps someone will awaken it and run it in a completely new way, or maybe it is activated only when needed. Anyway, the newsletter needs to go byebyes now, so….. Stay warm, and if you would like to kiss this toad and transform it into a prince, then pucker-up to Norman to awaken the newsletter from its slumber. Norman writes: The end of the line. https://www.youtube.com/watch?v=cwqhdRs4jyA. One hundred and fifty one issues at an average of 25 a year add up to something like six years of Houghton Valley Community Newsletters, which currently goes out to around 200 households in the neighbourhood. Alongside the website page it sought to be all things to all people but, as the person who has coordinated its compilation since 2013 (always with support from Grant from Hungerford Rd) it seems like its time to stop. Now we have the increasingly used Facebook page which provides both immediate communications and a record of activities; then there is the fantastic website, and Neighbourly, not to mention the school newsletter and other local e-networks such as those created by the local Playcentre and action groups Friends of Houghton Valley and Guardians of the Bays. The photographs shows one railway track ending but others going on – perhaps as good a metaphor as any for the closure of the newsletter while the journey of creating a healthy and connected community can continue using other means, should people wish. I’d urge everyone join up the local Facebook page and also take a look at Neighbourly, and think about getting involved with all the other community activities such as the south coast time bank, and …. The plan is to put out one more issue where people can comment on, well anything. Deadline, one week for contributions. 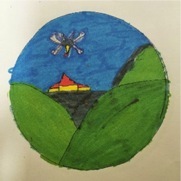 Ma whero ma pango ka oti ai te mahi – With red and black the work will be complete This refers to co-operation where if everyone does their part, the work will be complete. The colours refer to the traditional kowhaiwhai patterns on the inside of the meeting houses.